Jalandhar: In order to educate and communicate information on Oracle products and technology to students, All India Oracle Users Group (AIOUG) organised one day conference on Oracle Technology at LPU. MCA and B Tech students got an opportunity to learn and network through this event. Many distinguished speakers from the industry attended this conference, which was organised at SBRM Auditorium of the university. Students also interacted with industry leaders who updated them about the latest and emerging technologies. The key-speaker of the event was Co Founder & Vice President of AIOUG, Satyendra Pasalapudi who talked about right blend of business, technology oriented skills and executive leadership. Oracle database consultant and instructor, Aman Sharma forwarded his professional knowledge on ‘Road Map for oracle Certifications & Oracle ACE Program’. Similarly, Oracle ADF Consultant Rohan Walia told about Web-center Portal and Spaces. 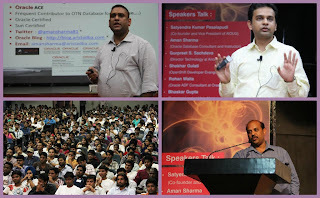 Author for many technical articles Shekhar Gulati let students aware about databases, cloud computing and latest happening in Java Community, and Senior Developer Jitendra Chittoda gave presentations on developing/improving Sequential Thread Pool. Illustrative, Oracle is the world's most complete and integrated business software suite. It is an object-relational database management system (DBMS) produced and marketed by Oracle Corporation. It engineers software to work together in the cloud and in clients’ data center. One can transform business by handling large data through it. It provides IT strategies to capture, store and manage growing volumes of data. papers on database management system it's most basic. However, things obtain more difficult once the characteristics with the information changes. this is a great sharing for one-day Technology Conference. Nice sharing for useful information about one-day Technology Conference. LPU is the best private university to learn software engineer. Some of friends who did their engineering are working in quite reputed MNC. Thanks LPU. All the best keep doing. No.1 University. Love your writing. great job.